The eighteen major Puranas are the Brahma, Padma, Visnu, Siva, Linga, Garuda, Narada, Bhagavata, Agni, Skanda, Bhavisya, Brahma-vaivarta, Markandeya, Vamana, Varaha, Matsya, Kurma and Brahmanda Puranas. The Brahma Purana consists of ten thousand verses, the Padma Purana of fifty-five thousand, Sri Visnu Purana of twenty-three thousand, the Siva Purana of Twenty-four thousand and Srimad-Bhagavatam of eighteen thousand. The Narada Purana has twenty-five thousand verses, the Markandeya Purana nine thousand, the Agni Purana fifteen thousand four hundred, the Bhavisya Purana fourteen thousand five hundred, the Brahma-vaivarta Purana eighteen thousand and the Linga Purana eleven thousand. The Varaha Purana contains twenty-four thousand verses, the Skanda Purana eighty-one thousand one hundred, the ‘Vamana Purana ten thousand, the Kurma Purana ten thousand, the Kurma Purana seventeen thousand, the Matsya Purana fourteen thousand, the Garuda Purana nineteen thousand and the Brahmanda Purana twelve thousand. Thus the total number of verses in all the Puranas is four hundred thousand. Eighteen thousand of these, once again, belong to the beautiful Bhagavatam. 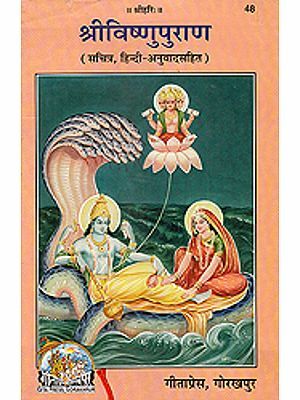 The Rg Veda, Yajur Veda, Sama Veda, Atharva Veda, Mahabharata, Pancaratra and original Ramayana are all considered Vedic literature. 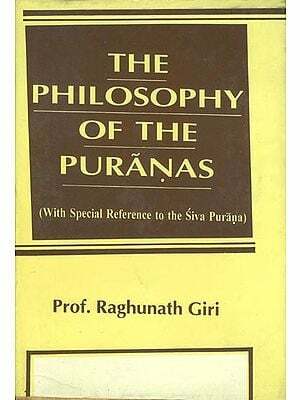 The Puranas (such as the Brahma-vaivarta Purana, Naradiya Purana, Visnu Purana and Bhagavata Purana) are especially meant for Vaisnavas and are also Vedic literature. The Visnu Purana as herein recorded was spoken by Parasara Muni to the sage Maitreya. Parasara Muni is the father of Krsna Dvaipayana Vyasa, the compiler of the Vedas and author of Mahabharata. Parasara is also famous as the person who gave the definition of the word “bhagavan” that Srila Prabhupada referred to countless times. The person who possesses all wealth, strength, fame, beauty, knowledge and renunciation is the Supreme Personality of Godhead, Bhagavan. There are two more verses from Visnu Purana that Srila Prabhupada quoted on numerous occasions: Visnu Purana 3.8.9 and Visnu Purana 6.7.61. The Visnu Purana is divided into six parts, including many of the well known narrations such as: The creation of the universe, the various planetary systems, the various Manus and their functions, the dynasties of kings, the transcendental pastimes of Lord Krsna and a vivid description of Kali-yuga. The Visnu Purana is one the eighteen major, or maha, Puranas. Of these eighteen Puranas, six are in the mode of goodness, six are in passion and six are in ignorance. 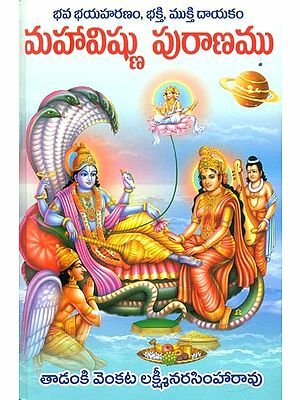 Visnu Purana is one of the six sattvika Puranas. 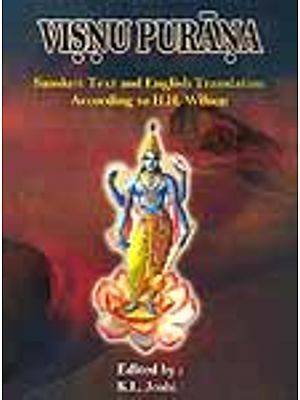 This is easily understood because the entire literature is aimed at making one understand the simple truth that Lord Vasnu, being the origin of everything, is one without a second. In other words, there is nothing in existence separate from Lord Visnu. The Visnu Purana as herein recorded was spoken by Parasara Muni to the sage Maitreya. Parasara Muni is the father of Krsna Dvaipayana Vyasa, the compiler of the Vedas and author of Mahabharata. 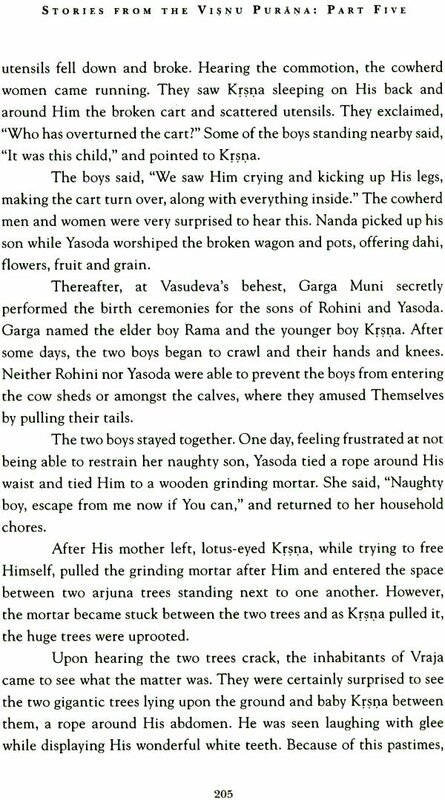 In Mahabharata, the story of Vyasa’s birth is told. Once, Parasara Muni desired to cross the river and the boatman had engaged his beautiful daughter, Satyavati, to ply the boat that day. Parasara became enamored with Satyavati’s beauty1 and while halfway across the wide river, he expressed his desire for intimate relations with her. Satyavati objected, saying that there were many sages living on the shore of the river and they would witness her transgression of ordinary morality. Parasara assured Satyavati that no one would come to know of her acceptance of his, and then he created dense fog. Thus Srila Vyasadeva was conceived in secrecy and was born on an island in that river. 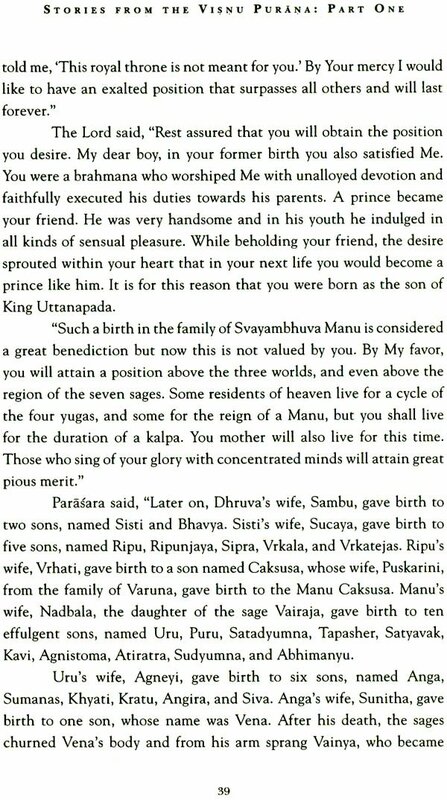 It is for this reason that he was called Dvaipayana. Parasara is also famous as the person who gave the definition of the word “bhagavan” that Srila Prabhupada referred to countless times. There are two more verses from Visnu Purana that Srila Prabhupada quoted on numerous occasions. One of these very famous verses was quoted by Sri Ramananda Raya when Sri Caitanya Mahaprabhu asked him about life’s ultimate goal. Ramananda replied, “If one executes the prescribed duties of his social position, he awakens his original Krsna consciousness. The Visnu Purana has six parts. 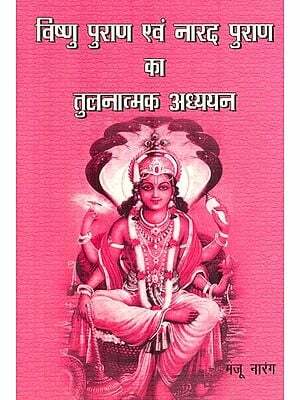 The first part deals with the creation of the universe, and also contains the following stories: Durvasa curses Indra, the history of Dhruva Maharaja, the history of King Prthu, the Pracetas marry the daughter of the trees, and the history of Prahlada and Hiranyakasipu. The second part tells about the various planetary systems within the universe. Bhumandala is described, then the regions below the earth, and finally the higher planetary systems. After the description of Patalaloka, there is a summary description of the hellish planets. There is then a detailed description of the sun-god’s chariot, as well as the chariot of the moon-god. Thereafter is the history of Bharata Maharaja, who thought of a deer while leaving his body at the time of death. 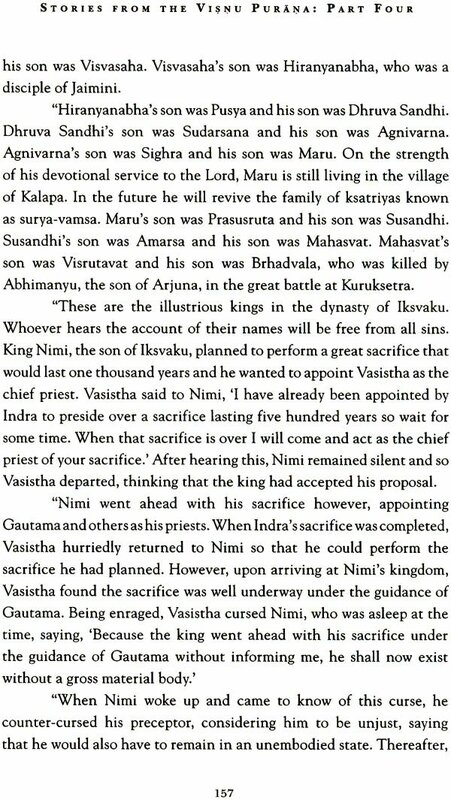 In this narration there is also a detailed account of the conversation between Jada Bharata and King Rahugana. The third part first lists the Manus; past, present and future. Then there is an account of how the one Veda is repeatedly divided and passed down from master to disciple in disciplic succession next there are instructions of Yamaraja to his servants, wherein he warns them to steer clear of the devotees of the Lord. In this part there are lengthy portions describing the duties of a householder, including the religious ceremonies he must perform. At the end is the story of how the Lord appeared as Buddha, to mislead people from the path of the Vedas. The fourth part describes the dynasties of kings. Especially listed are the descendents of Manu, and the dynasties of the sun and the moon. In this part is an elaborate telling of the story of the Syamantaka jewel. This jewel was awarded to Satrajit by the sun-god. It was lost, however, when a lion killed Satrajit’s brother, Prasena, as he was hunting in the forest. The jewel was finally retrieved by Krsna, and as a result, the Lord obtained Satyabhama and Jambhavatai as His wives. The fifth part narrates the transcendental pastimes of Lord Krsna, beginning with His appearance in the prison of wicked King Kamsa, and concluding with his disappearance due to being shot in the foot by an arrow shot by the hunter Jara. These pastimes are narrated in the Srimad-Bhagavatam, but these renditions found in the Visnu Purana are still very interesting because they provide many additional details and explanations. Some of the pastimes are expanded to include additional events. 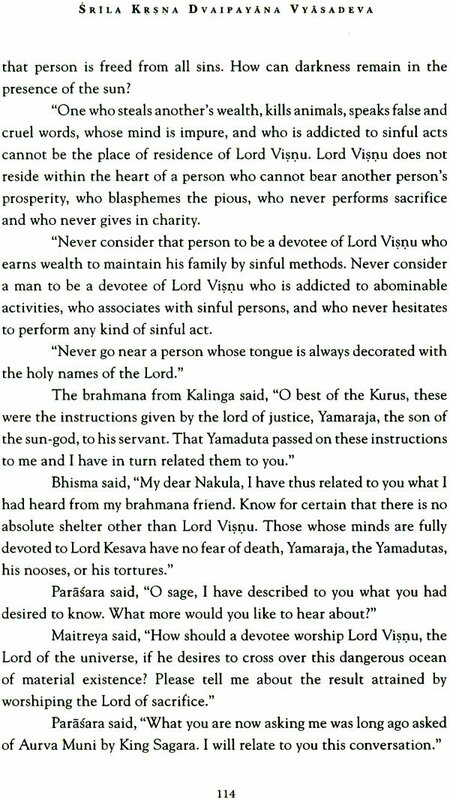 The sixth part gives us a vivid description of Kali-yuga. This is found in the course of an explanation of the three kinds of universal dissolutions. The Visnu Purana concludes with the story of Kesidhvaja and Khandikya, wherein devotional service to Lord Visnu is described as not only the best, but the only means for absolute liberation from the vicious cycle of repeated birth and death in material existence. While discussing devotion for Lord Visnu, the astanga-yoga system is described in detail, and the chanting of the holy name of the Lord is described as the most sublime process for self-realization. 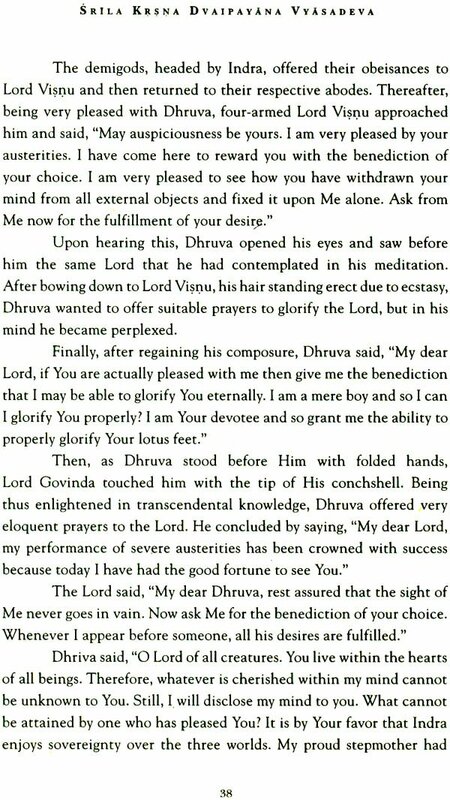 The book concludes with a description of the benefit one derives from hearing Visnu Purana. 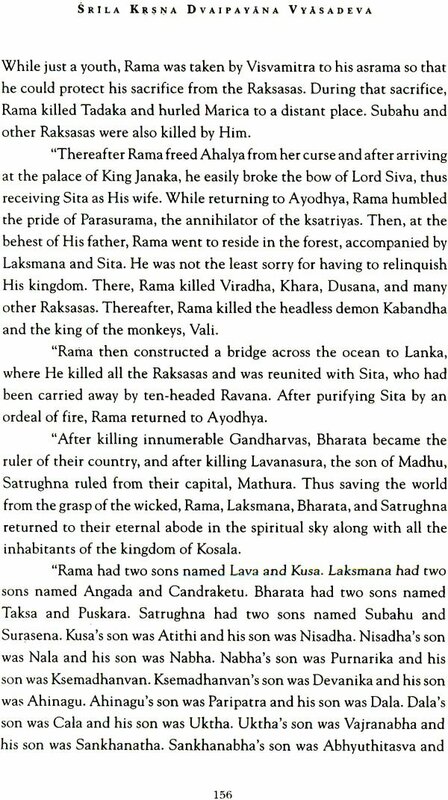 the history of Prahlada and Hiranyakasipu. appeared as Buddha. 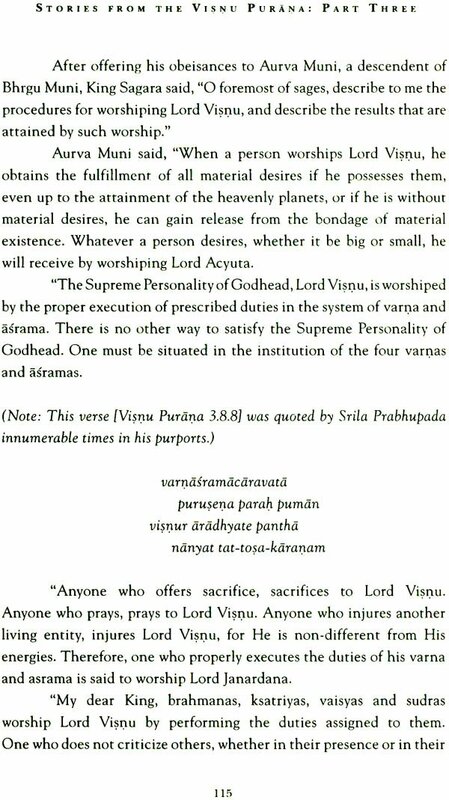 Description of duties of the four vedic asrams. 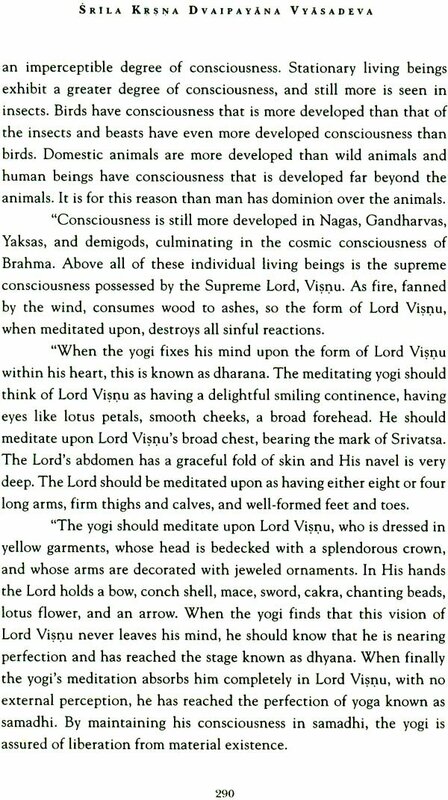 Description of Kali-yuga. The three kinds of universal dissolutions.